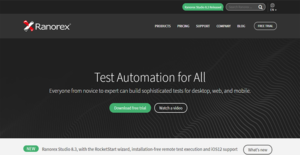 Ranorex is a test automation platform that enables all types of users, from novices to experts, to build revolutionary tests for different platforms. It is enhanced by its ability to execute tests locally or remotely on actual mobile devices or on simulators or emulators. Because of this, you can assess your program comprehensively. Additionally, Ranorex enables you to run parallel tests in different browsers. Because of this, you can accelerate the completion of this stage. Other than that, you can reduce the time spent on troubleshooting and spend more time on transforming your application into something that is bug-free and sophisticated. Ranorex Studio has the requisite tools for accelerating testing processes, as a single license affords you the ability to build and run tests for desktop, web, and mobile. On top of that, you can speed up the testing phase by running tests in parallel across Chrome, Firefox, Safari, Microsoft Edge, and other browsers. As a result, you have more time to smoothen the flow of your application. If you had to wait several days before running a test you have built, then you say goodbye to those times with Ranorex. That is because the program has intuitive and user-friendly tools that allow you to create scripts that are stable, efficient, and maintainable. You can do this regardless of your programming knowledge, thus enabling you to attain your goals faster. Knowing the status of your tasks is essential to keeping projects on-track. That is why Ranorex Studio has powerful reporting tools that display comprehensive information about the test execution workflow. With these, you can find instantly the line of code or element that has been causing problems for your application. As such, you can cut down the time spent debugging. Additionally, the program enables you to run the maintenance mode while the test is running so you can repair scripts and see how it unfolds on the fly. If you are interested in Ranorex it may also be a good idea to check out other subcategories of Best Test Management Software collected in our base of B2B software reviews. Every organization has different requirements and requires a system that can be customized for their size, kind of employees and buyers, and the particular industry they are in. For these reasons, no software can proffer perfect functionality off-the-shelf. When you look for a software system, first be sure what you require it for. Read some Ranorex reviews and ask yourself do you desire basic functionality or do you require complex features? Are there any industry-specific tools that you are searching for? Find the answers to these questions to assist your search. There are multiple aspects that you need to mull over and these include your budget, particular business wants, your organization size, integration needs etc. Take your time, check out a few free trials, and finally zero in on the platform that presents all that you want to boost your organization effectiveness and productivity. How Much Does Ranorex Cost? Ranorex offers three premium enterprise pricing options for perpetual licenses. These are listed below, as well as their inclusions, to help you decide which one is the most suitable for your needs. Runtime floating licenses are also available as add-ons. We realize that when you make a decision to buy Test Management Software it’s important not only to see how experts evaluate it in their reviews, but also to find out if the real people and companies that buy it are actually satisfied with the product. That’s why we’ve created our behavior-based Customer Satisfaction Algorithm™ that gathers customer reviews, comments and Ranorex reviews across a wide range of social media sites. The data is then presented in an easy to digest form showing how many people had positive and negative experience with Ranorex. With that information at hand you should be equipped to make an informed buying decision that you won’t regret. What are Ranorex pricing details? What integrations are available for Ranorex? For a complete list, visit the website. If you need more information about Ranorex or you simply have a question let us know what you need and we’ll forward your request directly to the vendor.